Many years ago I can remember sitting on the beach at North Era and reluctantly deciding to join the rest of the group portaging all our gear and boats about a kilometre over a steep hill and muddy track to South Era to avoid an almost impenetrable surf that had built up overnight. I say "almost" because Stuart Trueman was already sitting out the back. A paddle was broken, backs strained and egos battered but ultimately the rest of us walked to South Era. From that day forward I realised Stuart was a pretty unique and focused character. 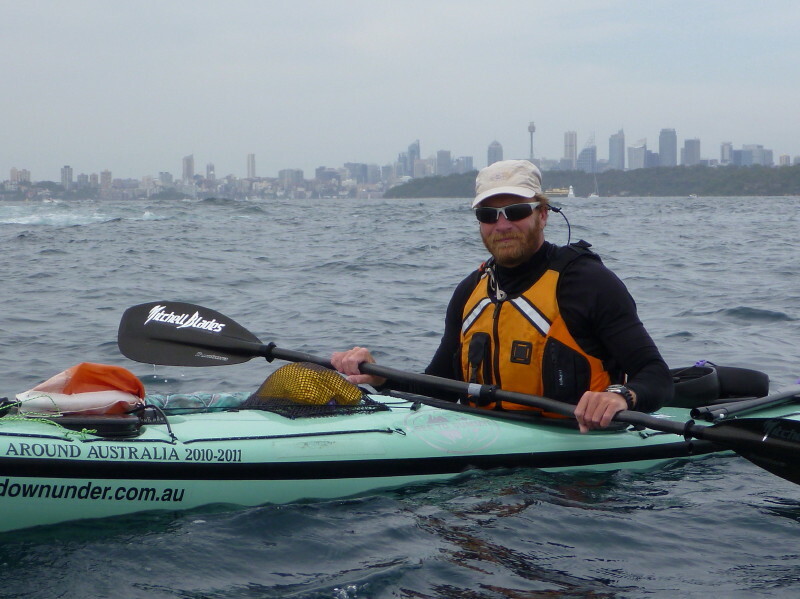 As I watched him paddle into Watsons Bay many years later nothing had changed except the challenges just seemed to be getting bigger. Given the sheer scale of his present undertaking and the distance he has achieved already, it was great to find his dry wit and good humour intact. It was a highlight of recent evening paddles to have Stuart as our special guest and a real privilege to buy him a beer. In return we got to hear his understated but at times chilling account of paddling the big cliffs at night and trying to land through heavy surf only to discover undercut rock platforms where he had hoped for sand. Stuart's respect for the achievements of others separates him from most others at the sharp end of the kayaking world. On numerous occasions I have seen him listening to vivid accounts of more modest adventures with the same genuine keenness as he would if he were comparing notes with peers. Then again he has so few equals in the sea kayaking world that these exchanges are probably an important means to remind Stuart that there are many people from a pretty broad demographic in the paddling community who share his passion for open water adventure. I think Stuart is refreshed by these meetings with paddlers experienced enough to grasp the enormity of his project. 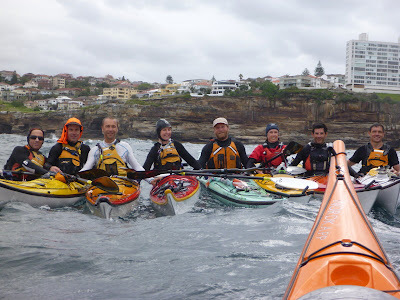 To sit around a table with people who at least speak the same language of sea kayaking, must be very reassuring when compared to the chance meetings with so many strangers who, despite their good intentions, know nothing of kayaking and just keep asking WHY? or even worse, dismiss his efforts as "madness". Stuart left Sydney on Wednesday. I paddled with him for a while as he eased into the steady pace that has pushed his kayak to so many wild and wonderful places. As I watched him disappear along the cliffs of North Head I realised that regardless of where I was over the next 7 or 8 months I could be pretty sure that Stuart would be out there clocking up the sea miles heading for Broome and planning his next adventure. Owen, Bill, Mark, Rae, Stuart, Wendy, Matt and Brett off Diamond Bay. Great to see this exceptional man undertaking this incredible personal journey in a locally made kayak. Three cheers for Stuart and another three for the Nadgee.